When you work in intercollegiate athletics, getting a single day off between August and mid-December is a rarity. In fact, since September 30 I have had a total of two days off. However, tomorrow will mark the first of 5 consecutive days off that I will enjoy. To be honest, to go from working long hours seven days a week to all of a sudden having a string of days off is a little overwhelming. But believe me, I am not complaining. Thanks to the Griz football team playing lights out the last four games of the season and earning a first round playoff bye plus basketball schedules that have both the Griz and Lady Griz on the road, I get to enjoy an extended Thanksgiving weekend. Not since college have I had the opportunity to do absolutely nothing from Wednesday through Sunday of Turkey Week. I made the trip from Missoula to Spokane after work today. I will spend my whole vacation at my parents’ house in the north part of the city. The last time I spent more than four days at my parents’ residence was when I was a college senior back home for winter break in December of 2008 and January of 2009. I am very excited to kind of put my bags down and enjoy some quality time in the house that I grew up in. Food, football, and fun will be the “three F’s” I live by this Thanksgiving holiday. My partner in crime will be my younger brother, Glen. We look forward to spending a lot of time together and continuing to build on the thousands of memories we have already created together throughout our lives. My sister also has a brand new kitten that I am dying to finally meet. I most likely will not be posting again to Don’t Blink until next Monday but there is always the chance that I might slip something in between now and then. Have a great Thanksgiving everyone! I am very thankful for my wonderful readers. Don’t Blink. Congrats, Mr. Official of the Year! Late last week the Inland Empire Football Officials Association held its end of the year banquet. This event served as a time for the association’s 100 football officials in the city of Spokane to get together as a group, enjoy some good food, listen to a guest speaker, and hand out a few awards. At the very end of the night they presented the biggest and most important honor, the coveted Official of the Year award. 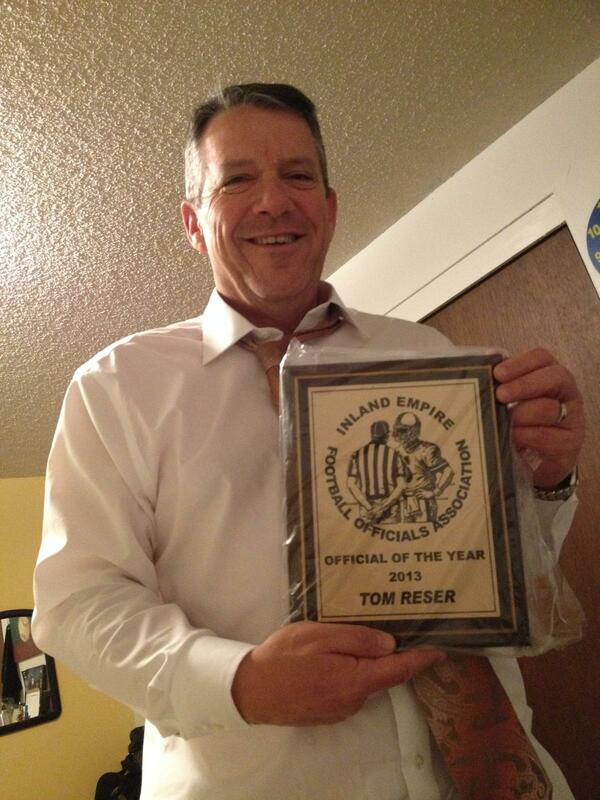 With his wife seated right next to him, Tom Reser heard his name called. My dad with his very well deserved Official of the Year award. Last Thursday night my mom sent out a joyful text message to the three of us kids declaring the good news that our dad had won Official of the Year. All by myself in my apartment I immediately got a beaming smile across my face and my eyes watered up. I took a couple minutes to let the pride and emotion that I felt settle in my body before I composed a congratulations text to my dad. Later that night when my dad and mom returned home from his well-deserved moment in the spotlight I got to call him and tell him how I proud I was. He had done it. My dad flipping the coin to start one of the 600 games he has officiated. 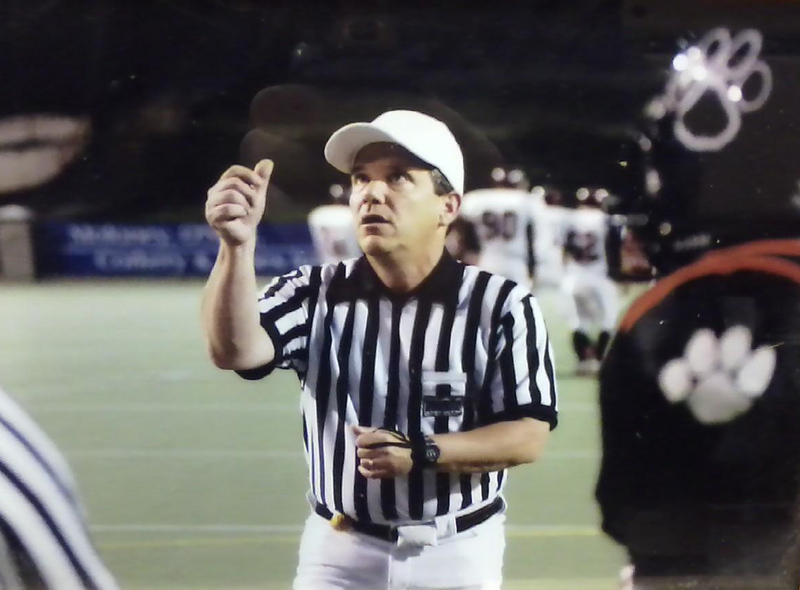 After twenty-nine years as a football official, twenty-seven of those coming in the IEFOA, my dad had achieved the highest honor that he possibly could at the high school (and everything underneath) football level. You might say I am a bit biased being his son and all, but let me tell you, no one could have been more deserving than my dad. It is proven: You do something better when you are passionate about it. My dad is, and always has been, passionate about officiating football. I grew up with my dad coming and going in his stripes. By the age of six I knew every single football hand signal because he took the time and displayed the amazing patience to teach me. My dad would slip me into one of his referee outfits and with me drowning inside of it I would perform the hand signals exactly as my dad called them out. Probably all the way up until I was twelve years old when someone asked me what my dad did for a living I told them that he was a football official as opposed to mentioning that he worked in administration at the Spokane Veterans’ Affairs Hospital. 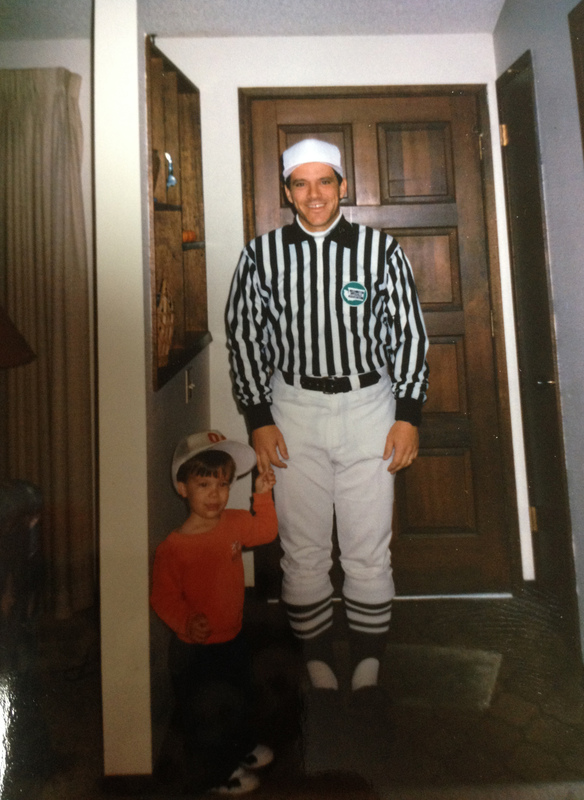 From the time I was very little I admired my dad and wanted to be a referee like him. When I did start to get older I took more of a notice on how dedicated and involved he was with officiating. A couple months before the season started I would see him studying up on his officials’ manuals. I would see him polishing his officiating shoes rigorously. I would observe him calling other officials to let them know when meetings were. I would go to trade shows with him where he would set up a booth and try to recruit new referees to the association. I would watch him spend his own money on sandwiches and Gatorades for his crew. After working a hotly contested varsity high school game on Friday night I would say goodbye to him on Saturday morning as I went to my own football practice and my dad went out to a dingy complex where he would officiate three straight YMCA fifth grade games. By the time I was playing high school football my dad had rose to a permanent white hat. He had become well known in the association as a well-respected referee. Because of this I would sometimes vent my frustrations to him when I felt (as most high school football players do) that our team got screwed by the zebras. Even with me taking shots at his fellow officials who he defended to no end, my dad would always take the time to listen to my concerns and then address them. Although my dad couldn’t officiate games that I participated in, he would always do our Mead High School Blue-Gold scrimmage. I always felt honored to share the field with my dad and have my teammates tell me what a cool old man I had. My dad starting a game between Lewis & Clark and Central Valley. As I moved away, went to college, and started my career in Missoula, my dad continued to prosper as an official. He received more big time assignments, he was awarded several state playoff games, and he served on the officiating board. In a true show of leadership, my dad took it upon himself to create a sportsmanship traveling trophy. 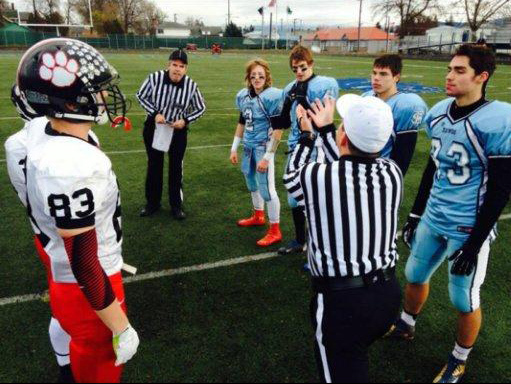 Each year now, the officials get together and vote on a team to win the sportsmanship award. It can be a varsity, JV, or freshmen team. My dad then travels to that squad’s end of the year banquet and surprises the players with the trophy. I truly believe the pinnacle of my dad’s career came this season though. You see, at the start of this year my dad started a mission to lose weight. With 4:30 a.m. workouts and a strict diet that he followed religiously my dad was successful in his mission and lost 40 pounds. I think it was this final outstanding, selfless, and disciplined effort to improve his officiating and overall life in general that pushed him over the edge and made him the obvious choice for Official of the Year. My dad has always told my brother and I that his dream is to one day officiate a game with both of us on his crew. Although at this point in my life that is not possible maybe one of these days I will have time to take up officiating and make my dad’s dream come true. Until then , even though he never told me he wanted this, I like to believe another one of his dreams came true last week: He was named the best at what he does, the best at one of his passions. Congrats dad, there is no one who worked harder at it than you. I am so proud of you. Don’t Blink. It has been one of those weekends where I sit back and let the pride, thankfulness, and awe of getting to work in the University of Montana Athletic Department just engulf me. Although I am always so proud to be part of something as special as Grizzly Athletics, weekends like this always give you an extra jolt of joy. Three awesome things happened to the Maroon and Silver this weekend that has everyone associated with the University of Montana and really the whole community of Missoula on fire right now. Let me brag for a little bit. Griz-Cat Triumph: Let me start with the best. Yesterday in Bozeman, the Montana Grizzlies and Montana State Bobcats squared off in the 113th Brawl of the Wild. In a game that at the start of the season any MSU fan would say the Griz would get trounced in, Montana went into Bobcat Stadium and doubled up the Cats, bringing back the Great Divide Trophy to our department with a 28-14 victory. This one was sweet. I felt very fortunate to stand on the sidelines and watch yet another trouncing of Montana State at the hands of our student-athletes and coaches. While I might have felt a little bad for the record crowd who turned out in Bozeman to watch their team’s playoff hopes die, I felt exuberant for Griz Nation. After Jordan Canada scored the last touchdown of the game and put his finger to his face to quiet the Montana State student section once and for all, the celebration was on. It literally made my year watching my good friend Norm Jones take the trophy out to midfield where the offensive line dutifully picked up the large award and carried it around the stadium for two renditions of the fight song before planting it at midfield where the team then gathered around it to say a prayer. After looking at the scoreboard one last time just to confirm that the Griz had added yet another notch to its side of the lopsided Brawl of the Wild record, I turned around and walked out of Bobcat Stadium with a big smile on my face. With the final score behind us, Brynn and I enjoyed the victory in Bobcat Stadium. Griz Volleyball Wins on Senior Night: The Griz volleyball team turned a great day into a spectacular day when they defeated Sacramento State on Senor Night. Although a little concerned that I might miss the match because of the Griz-Cat football game running long and the unpredictability of the road conditions from Bozeman to Missoula, I walked into the West Auxiliary Gym in the middle of the first set. This year I served as the Marketing Director for the Griz volleyball team so I became very passionate about the squad, especially its four seniors. After a couple years of not making the Big Sky Conference tournament, the team clinched a spot this past weekend. With one goal in the books, the next goal of winning on Senior Night was attainable. The Griz didn’t let the opportunity pass them by as they defeated Sacramento State in five sets. Instead of running the game from the scorer’s table I got to watch the special victory as a fan from the stands. Seeing Brooke Bray, Kayla Reno, Kortney James, and Megan Murphey go out as winners at home made my night and capped off a memorable day for Grizzly Athletics. 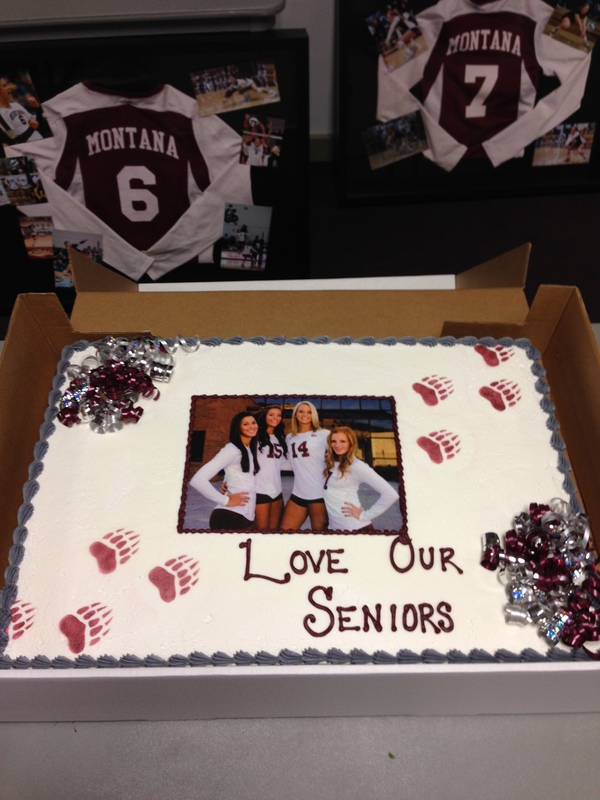 Congrats to our volleyball seniors (Brooke Bray, Kayla Reno, Kortney James, and Megan Murphey) on great careers. Griz Football Receives a Playoff Bye: After Montana dumped the Cats on Saturday afternoon, the question on everybody’s mind was when the Griz would play in the playoffs. Would they receive a bye or would they be playing Thanksgiving weekend on November 30? The debate raged everywhere from message boards to social media to the bus I rode home from Bozeman. With so much talk swirling around I asked our Sports Information Director what he thought our chances were of getting a bye. He told me 50-50. I woke on Sunday morning anxious for the announcement. I wholeheartedly believed the team should be given a bye but understood the case against them and with the 50-50 prognosis that Dave gave me, I tried to get prepared for both scenarios. I followed the announcement on Twitter and the wind came out of my sail a little as they started to reveal the first several eight seeded teams (the ones who get byes) and Montana was not represented. After the announcement of seven teams without Montana being one of them, I thought I would be working in Washington-Grizzly Stadium on the Saturday of Thanksgiving weekend. But right when I started to wonder who our first round opponent would be the eighth and final seed was announced and much to my excitement it was Montana. Of course the bye is most important because it will give our team the chance to heal up, rest, and play a team that they get to watch a week prior. But for us staffers in the athletic department, it also gives us a very nice holiday weekend. I now get to a plan an extended holiday break in Spokane with my family and I couldn’t be more excited. All I can say is thank you so much to the football team for making this a possibility! 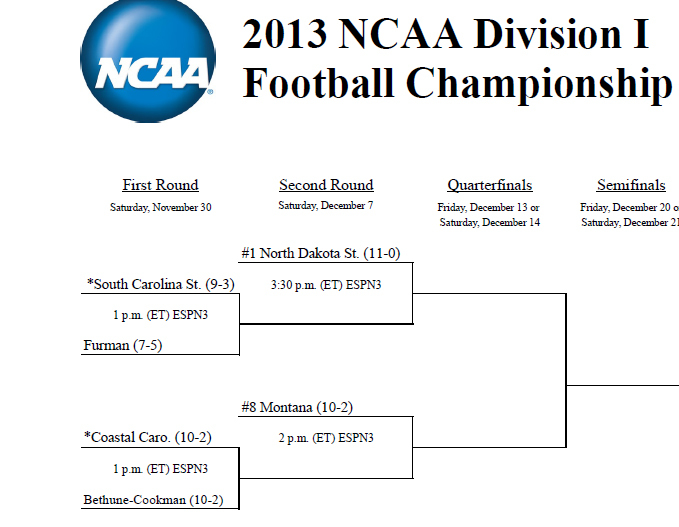 Montana will face the winner of Coastal Carolina and Bethune-Cookman on December 7. It truly is a great time to be a Griz (even though it always is). Congrats to our amazing student-athletes and coaches. This is going to be one happy Thanksgiving. Don’t Blink. 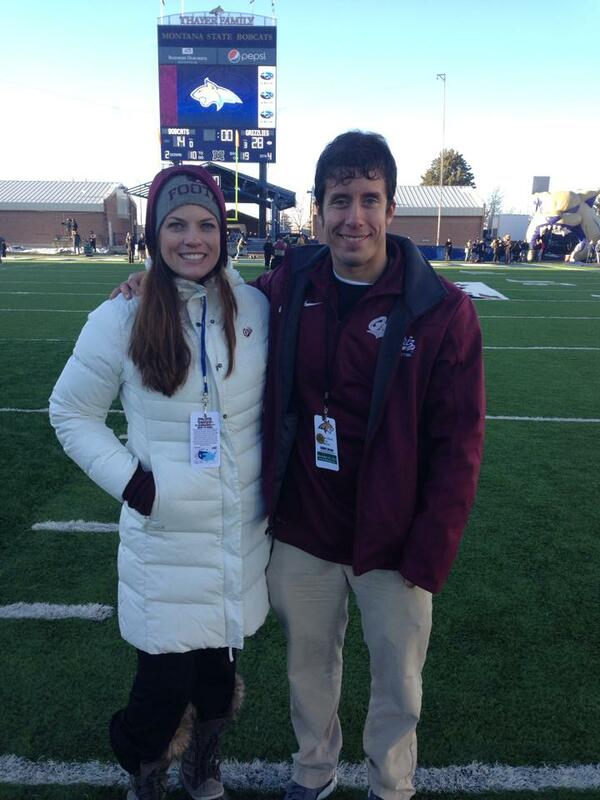 Last night I read my good friend Shaun Rainey’s blog post on why he enjoys the Griz-Cat football rivalry so much. One of the reasons why he looks forward to it is a relatively new concept that in my opinion has completely invigorated not just the Brawl of the Wild but rather every single rivalry in the nation. For probably just a couple years now this new yet simple form of media has helped fight against the unoriginality and cliché driven nature that had started to define many of these passionate head to head battles across the country. Memes? Yes! As in the basic presentation of a picture accompanied by a line or two of user generated text that conveys a joke, insult, or point. Back in the day we would just call them picture captions. But with the proliferation of the internet and social media combined with the specific physical appearance of such images, we have entered the fancy term of “meme” into our lexicon. At this time I can’t necessarily say that overall I am a big time lover of memes. While I always got a laugh out of the Willy Wonka ones, I find many of the ecard and mass generated poorly developed memes stupid. However, I do appreciate many of the memes that poke fun at a certain side of big time rivalries. Not only do they deliver a good laugh but they have helped to break up a streak of lameness that started to run rampant. Not only are the above jokes very old and practically not even funny anymore but they are completely unoriginal. They can apply to every single school in every single rivalry. There is absolutely no personalization or cleverness with them. But for some reason people would still tell them and still post them. You would get an e-mail that said “Oregon jokes” or you would see a thread on a message board that said “Montana State jokes” and you would read them and they would contain the exact same stories and one liners, the only thing changed was the name of the school. How stupid. They really weren’t Oregon jokes or Montana State jokes, they were just recycled rivalry jokes. I welcomed sport rivalry memes with open arms. Finally there was something that channeled the creative juices of fans and enabled them to think up some very cunning and very funny jokes. 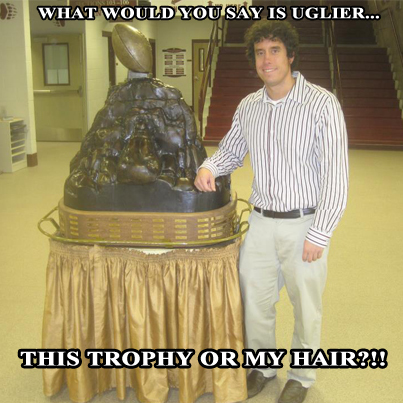 Memes center completely on a photo so you must find an image that is specific to one of the schools in the rivalry. Once you have a unique photo you are going to go the distance to create a unique caption. You aren’t going to ruin a good photo with a terrible clichéd one liner. Instead you are going to think up something so that the second someone looks at the meme they are going to fall over laughing. Although I started to see the positive change last year, I have immensely enjoyed the explosion of rivalry memes this year. The increase of memes has brought the decrease of the terrible jokes. People no longer have time for that garbage. Fans are now hungry for clever visual jokes that poke fun at the culture and ways of the rival school. During this Griz-Cat week I have seen some hilarious memes from both sides. Naturally some do cross the line but for the most part it is spirited, passionate fun. Don’t get stuck resorting to the unoriginal and overdone. Instead embrace the new avenues available to bring fresh laughs to rivalry week. Don’t Blink. Much to my enjoyment I got word today that the Grizzly Athletics Social Media program had made a very exclusive list. 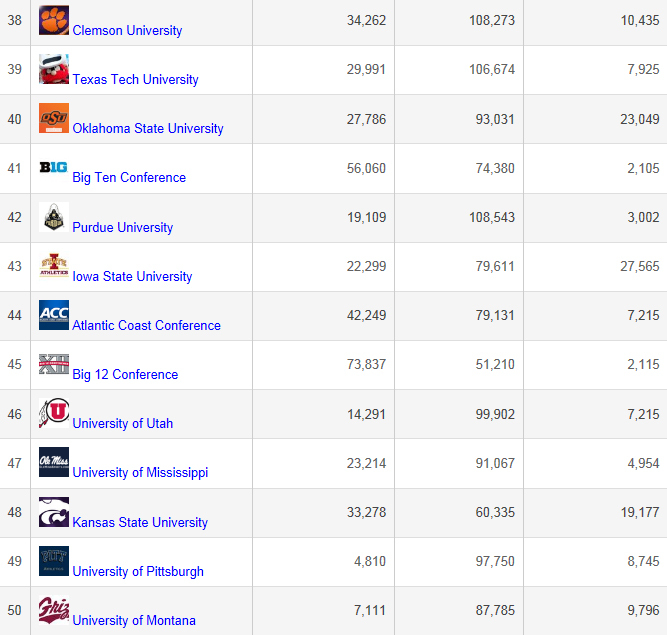 Thrown in with schools like Ohio State, Florida, Oregon, Alabama, and the other BCS giants, the Montana Grizzlies are represented on the Top 50 NCAA Social Media Rankings list conducted by Sports Fan Graph. Talk about making my day! Okay, so I do have to admit that Montana is #50 overall on the list but that does not take anything away from the achievement. There is one social media short list in the nation that ranks NCAA schools according to their social media prowess and the Griz are on that list. Our school is not just the only Big Sky Conference institution on the list, it is the only FCS institution on the list. Better yet, there are 120 BCS schools in the country. That means that Griz Nation has a social media campaign that is better than 70+ mostly bigger, better funded, and higher staffed schools around the United States. I can legitimately say Montana beats out over 70+ schools because conferences are also allowed on the top 50 list and the Big 12, ACC, and Big 10 are all on it. That means with conferences taken out of the discussion, Montana would have the 47th ranked social media program in the nation and thus sit in front of 73 other BCS schools. Griz Social Media is in some pretty good company. To back track just a little bit, if you remember me referencing this list a little over a year ago you are not going crazy. In October of 2012, schools across the country started to make mention of Sports Fan Graph. The organization had ranked schools and teams from college to all of the major professional leagues on their social media programs using a formula involving Facebook likes, Facebook interaction info, and Twitter followers. When it came to the NCAA, they ranked the top 200 schools! At the time, Griz Social Media was ranked #53. Fast forward a year later and anyone knowledgeable in social media will tell you that Grizzly Athletics moving up three whole spots instead of regressing is a big accomplishment. I am proud to rock our Griz Social Media t-shirts. You see, over the past year, athletic departments across the country have really started to go all-in on social media like never before. Athletics directors have finally woken up. They realize that social media is the new and most effective way to report, market, and inform fans about an athletic program. Time, involvement, and care with social media has skyrocketed. Many schools are starting to hire staff members who work solely on social media and nothing else. With the major emphasis on social initiatives by many of the major schools one might have expected the Griz to fall down the rankings. You can have Mark Zuckerberg run the social media program at any school in the nation but if he doesn’t have a fan base that is passionate, supportive, and hungry for information he won’t succeed enough to have his school land on a list such as this. The fans who support the University of Montana are off the charts and it extends all the way through to social media. They bring the passion on a daily basis through their smart phones and keyboards to make everything social in our athletic department a big success. Thanks for once again putting UM on a national list, Griz Nation! Don’t Blink. If you read this blog enough you that in addition to this daily public record that I write, I also have a daily private record that I write. Yes, I am a big time journaler. For almost fifteen years I have written a detailed summary of every day within that span that I have lived. About five months ago I merged my blogging and journaling together. I wrote a post where I used my journals to give you a summary of every June 26 that I had lived for the past ten years. That particular post got descriptive and it also got very long. TODAY, Tuesday, November 19, 2013 – Typical busy day with Griz-Cat week in full swing. Got even more in the mood for the big game by attending the weekly press conference and the first practice of the week in the rain. After work I went to the local hospice center where I volunteer at and made about 20 phone calls to people reminding them about an upcoming community event. Friday, November 19, 2012 – I created our UMGRIZZLIES Instagram account. One year later it has 2,306 followers and I have posted 609 different photos/videos to the account. Also on this day, Christie overheated our microwave in the office and filled up the whole area with thick smoke. The microwave was totally ruined and we had to take it outside where we were able to open the door and take out the charred bag of popcorn. Saturday, November 19, 2011 – The cheer squad, some fellow staffers, boosters, and myself boarded a bus and we headed over to Bozeman for the 111th Brawl of the Wild. With everyone expecting the #1 ranked Montana State Bobcats to easily win the game, the Grizzlies had other ideas as they kicked the snot out of the Cats, 36-10. Standing on the sidelines watching our football team pull off the upset was a pretty neat deal. To this day it is one of my fondest memories. Friday, November 19, 2010 – On this day I spent the morning prepping for the football game the next day, conducting a Monte rehearsal, and getting a workout in. I then spent the afternoon working sporting events. 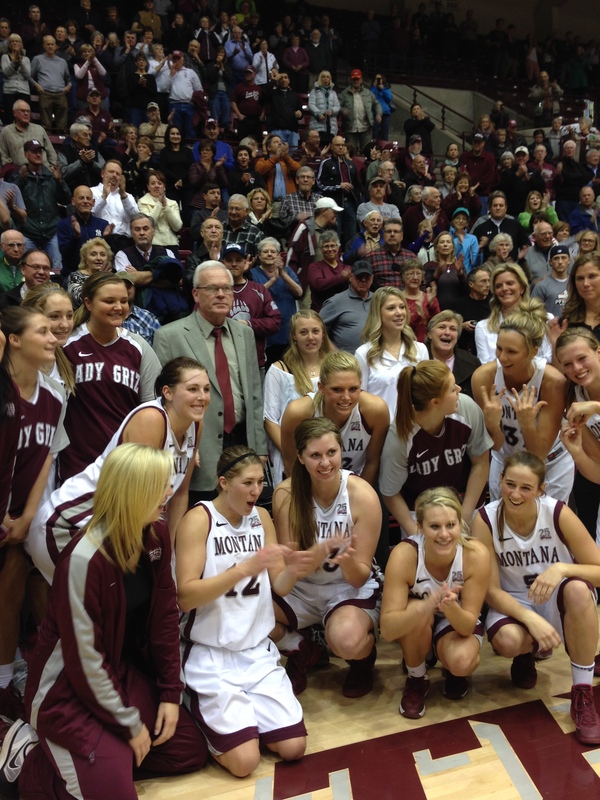 Our Griz basketball team played a very rare 3 p.m. weekday game against Montana Tech. The contest was never close at all as the Grizzlies pounded Tech. After that game I picked up my equipment and moved from Dahlberg Arena to the West Auxiliary Gym where I worked the 7 p.m. volleyball match against Weber State. Staying with the blow out theme, our volleyball team swept the Wildcats, 3-0. Thursday, November 19, 2009 – I worked a pretty regular day and then worked out at 6 p.m. I grabbed a bean and cheese burrito at Taco Del Sol and then my friend Dan and I went to the Missoula Maulers hockey game where it was Mascot Night. During one of the intermissions they had the mascots play (rather attempt to play) a game of hockey on the ice. Besides Monte and Mo and the Maulers mascot, you also had costumed characters such as Red Robin, the Little Caesars guy, and a local taco mascot. It was quite entertaining. Wednesday, November 19, 2008 – I rolled out of bed at 5:30 a.m. and walked to the gym for my 6 a.m. workout. Later on in the day I worked on my semester statistics project with one of my group members, Jamie Groy. Man, that project brought about a lot of stress. Staying true to my broke college student ways, I donated plasma after lunch. I weighed in at 188 pounds and I got paid a whole $20 for an hour of discomfort. Later that night I got to experience the famous Jaker’s Happy Hour for the first time. BONUS: Friday, November 19, 2004 (decided to throw this one in just because it is the oldest record I have here at my apartment…I have older journals located at my parents’ home in Spokane): Ahhh…my senior year at Mead High School. We had an easy workout for zero hour weights. In Accounting we worked on chapter 14. In Trigonometry we took the non-calculator portion quiz of chapter 3. In my Art-History class we looked at Byzantine art. In AP Government I got my 43/48 test back. I then went to basketball practice where I was a manager. I then came home and did homework and watched the Gonzaga basketball team beat Portland State. I then watched highlights of the ugly NBA brawl between Indiana and Detroit. Thanks for getting in the time machine with me and going back through the years. Remember, you are never too old to start journaling. It has been very rewarding for me. Don’t Blink. Tonight I feel truly blessed to have worked a game that ended in an amazing accomplishment, by far the greatest basketball feat I have ever witnessed in person. 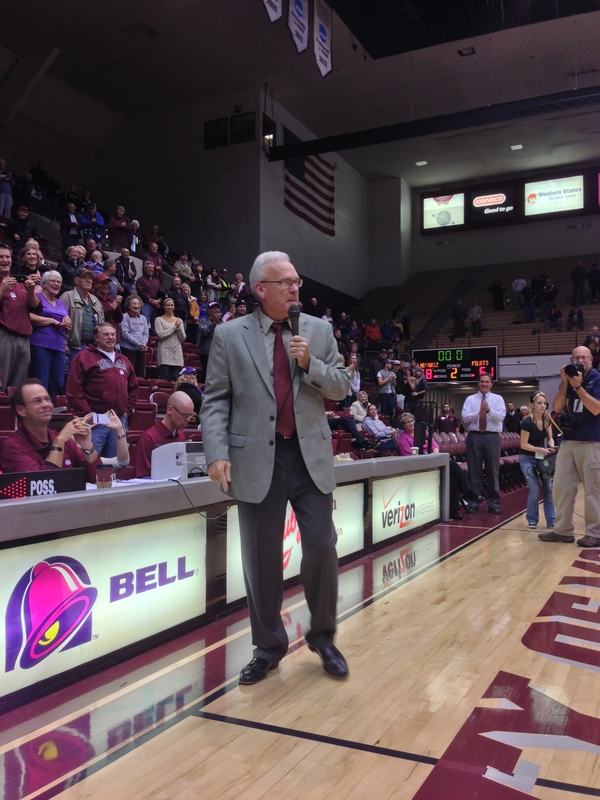 Our women’s basketball coach here at the University of Montana, Robin Selvig, picked up his 800th victory as the Lady Griz defeated a tough Portland team, 68-61. Just a few statistics for you real fast: There are only seven other Division I active coaches who have 800 wins. Coaches with names such as Krzyzewski, Boeheim, VanDerveer, and Auriemma. Coach Selvig has had 33 winning seasons. He has had 28 seasons where he won 20 games or more. He has won conference coach of the year 20 different times . And my favorite, he has guided the Lady Griz to 25 NCAA tournaments! That is worth repeating, he has taken his team to the Big Dance TWENTY-FIVE times. But the number that really strikes me about Robin is 35. That is the number of seasons he has spent as head coach of the Lady Griz. The intercollegiate athletics coaching business is not about loyalty, well at least not to 99% of the people in the industry not named Robin Selvig. Coach could have packed up and succeeded at other head coaching positions but decided to stay at Montana. He could have traveled off to East Lansing when Jud Heathcote asked him to be an assistant coach at Michigan State. He could have pursued a multitude of other basketball related positions with higher salaries in warmer climates. But he chose to stay where he was happy. He chose to stay where he knew he was making a difference. He chose to stay at a place where a rabid fan base needed him. 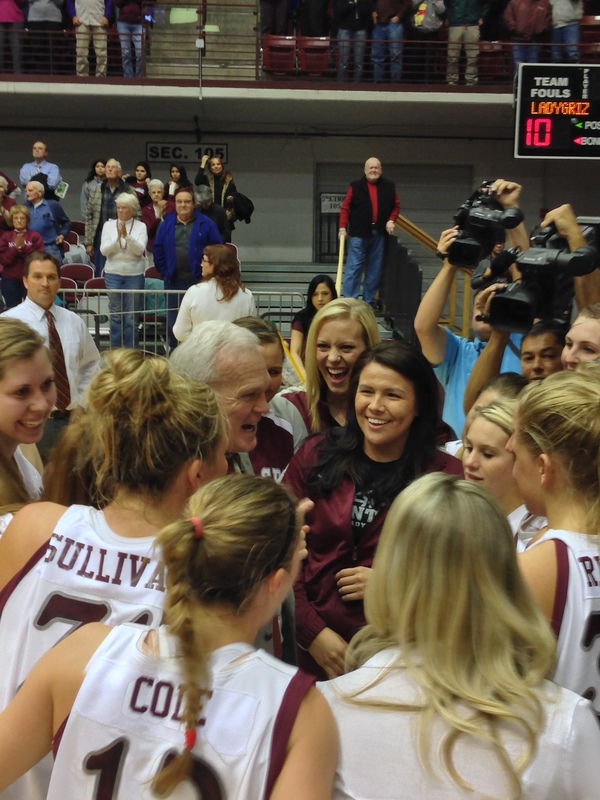 Coach Selvig spent a happy minute with his team in the huddle after winning his 800th game. Just a couple personal things about Robin Selvig that I would like to mention. Besides that he is a star employee just based on the fact that he has produced 800 wins for Grizzly Athletics, he is an invaluable employee because of how he conducts himself in the athletic department and how he treats others. Never too big for anyone, Robin always takes the time to look me in the eye and cheerfully greets me with a “Hi Brent” whenever we cross paths in the hall. He never thought twice about helping us out when we filmed a Monte video where we had him stand in an elevator (he played the part perfectly). Don’t put it past him to dress up in a Santa Claus outfit either because he will do that instantly. During press conferences he takes questions from everyone and always responds with an articulate, and many times hilarious, answer (please let me take this moment to say that very few people on this planet come close to matching the sense of humor that Robin has). His heart is enormous and he has helped countless people by way of his program, and I am not just talking players. Besides everything I just mentioned, I have personally witnessed Robin Selvig stand up for those around him and those he has worked with in big time, high stakes situations. It was incredible to see and will forever make me recognize Robin as an amazing person before I recognize him as an amazing coach. Congrats Coach Selvig on your 800th win. Robin Selvig is a legend. There is no other way to say it. He is a giant in the state of Montana, a highly regarded coach nationally, and a stand up human being. I will take it to my grave that I roamed the same halls as Coach Selvig for no less than four years and that I got to stand two feet away from him as he delivered his 800th victory speech. As you could probably guess, he gave all the credit to his players. Ladies and gentlemen, Robin Selvig. Don’t Blink. Griz-Cat week has arrived and there is no better time to be a Montanan! (even if you are an import like me). This Saturday the Grizzlies and Bobcats will meet in Bozeman for the 113th football meeting between the two schools. As I said last year, I realize that this game probably doesn’t hold the weight and tradition that some of the other rivalry games across the nation do but to this state and to me, this is where the buck ends. Griz-Cat is so much more than a football game to the people of the Treasure State. For many, it is a measuring stick for each person associated with the rivalry to see where they personally match up compared to their rival. Although I always keep an eye on what MSU is doing, during this week I especially like to see how the areas that I directly oversee compare to those of our rival. For me that means I look long and hard at our website, social media, mascot, and a few other things in relation to Montana State (I like where we are at). Other people do the same thing with their respective areas. State supremacy is on the line this week and everything must be thrown into the equation. Of course the most important thing in that equation is the football game on Saturday. A school could hold every single advantage on the other school but if it lost the game on the gridiron, all of those accomplishments mean nothing…at least for that day. As is well documented, the Grizzlies have crushed the Bobcats overall in the Brawl of the Wild. Currently Montana enjoys a 69-37-5 edge in the series. But please go ahead and throw every rivalry cliché in the book at me right now, I realize records mean absolutely nothing for games like these. Montana will have its work out for them on Saturday. Montana State is playing at home and no doubt they will play with a lot of anger and urgency as they try to end a two game losing streak and make the playoffs. The Bobcats have several marquee players on their team who will undoubtedly bring their “A” game this weekend. The Grizzlies will have redemption on their mind. After dropping a close game last year to the Cats, Montana will go into Bozeman looking to add another “W” to the Griz-tilted overall Brawl of the Wild record while possibly securing a bye in the first round of the playoffs. For myself I am beyond excited for the game on Saturday. Among working the 2009 Montana-App State game, going to the NCAA Tournament, and working that faithful tournament championship Saturday where we sent both our women’s and men’s basketball teams to the Big Dance, the 2011 Griz-Cat football game is one of my favorite memories during my tenure working for Grizzly Athletics. I hope to have a similar experience when I go to Bozeman this weekend. To all the Grizzlies and Bobcats out there, have a great Griz-Cat week! This is a wonderful time for the state of Montana to celebrate two great universities. A few reminders: 1. 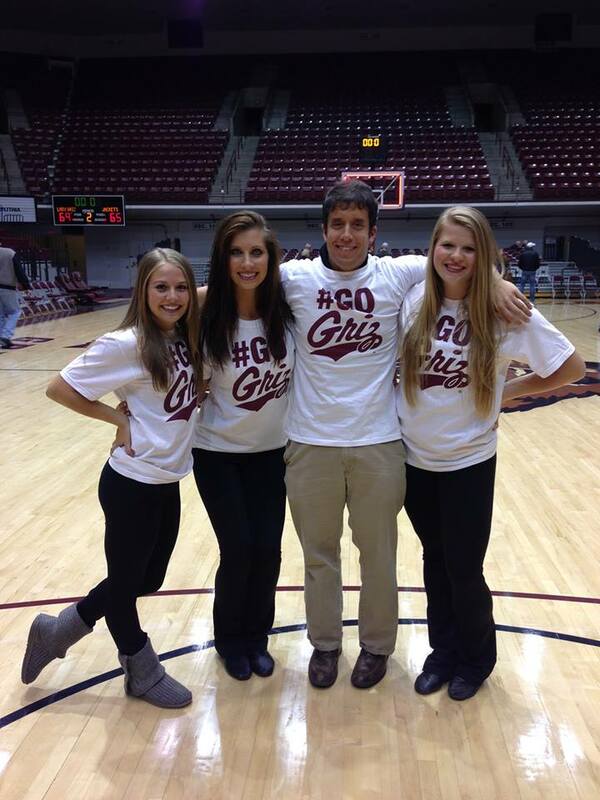 Use the #GrizCat hash tag for all Tweets, Instagram photos, and Facebok posts. 2. Be respectful to the other side at all times. 3. Remember that kick off is at noon in Bobcat Stadium on Saturday. Enjoy the week and Go Griz! Don’t Blink. I always enjoy getting comments on my blog posts, both positive and negative. It lets me know that people are reading and that they care enough to go the extra mile and type out a response. Quite often the comments I receive on Don’t Blink come way after the fact. It will be 2:30 a.m. on a Tuesday and I will get an e-mail telling me that someone commented on a post that I published a year and a half ago. Many times people will go on Google searches, find something that I wrote, and sound off. Although this is typical, sometimes comments will come under different circumstances. Last night I wrote a blog post about the app Bitstrips. It was essentially a review of the service. I did point out a couple things that I didn’t care for but I didn’t go overboard or anything. About five minutes after I published the post I had an e-mail notifying me that I had a new comment on my blog. I opened up the e-mail thinking that the comment would be under a post I did several months ago or maybe from one of my friends who made a facetious comment on the post I had just written but I was wrong on both fronts. 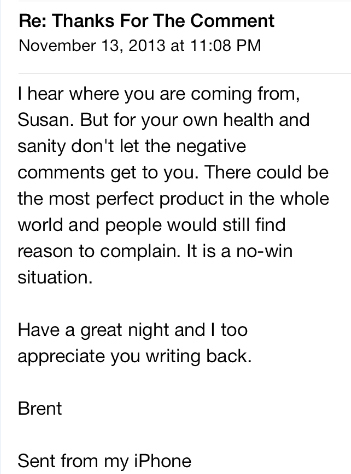 Instead I received a reply from a woman named Susan in Toronto regarding my Bitstrips post. 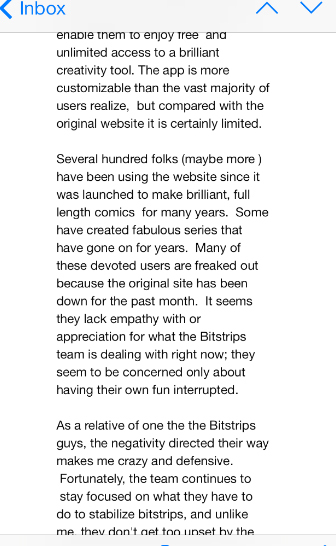 In four logical and well-reasoned paragraphs she countered my criticisms by giving me a history on Bitstrips and then using that to illustrate how the service once used to allow for more creativity (one of my main complaints) but was altered when users wanted a more simplified product. Here is a piece of the comment that Susan left under my Bitstrips blog post. I was intrigued by her response for a couple reasons. First, how did someone in Canada come across my blog post so quickly? Secondly, what made her so passionate and defensive of Bitstrips? I decided to dig deeper into my second question. I sent an e-mail to the address she left asking if she worked for Bitstrips and if she was not employed by them, what was her stake in the app as obviously from her comment I could glean some type of existing relationship. Within ten minutes I had my answer. 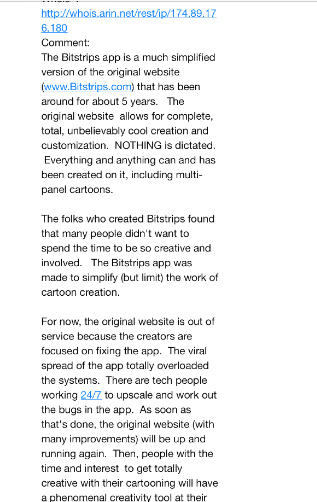 This was some of the e-mail I got from Susan explaining that she was related to one of the Bitstrips’ founders. In our daily lives we can’t get “crazy and defensive” when others point out perceived flaws with organizations/initiatives/efforts/causes that we are associated with or directly invested in. While it is definitely important to listen to criticisms, it can be fatal to become so wrapped up in the negativity that you allow yourself to “go crazy”. I work in a position and for an employer where I am/we are judged continuously for every little thing under the sun. There is absolutely no way to please everyone. If I didn’t have this squared away in my head, I couldn’t do the job I do. I tried to pass on this mindset to Susan. The last thing she needs to worry about is the opinion of some guy who lives thousands of miles away from her who had only used Bitstrips for less than 24 hours. Don’t Blink. The past couple weeks I kept seeing simple cartoons featuring the comic book version of my friends popping up on my Facebook newsfeed. As these cartoons became more and more prevalent I started to get a little annoyed. In my hasty judgment I declared them as stupid. But I was reacting to these cartoons in the exact same way a person reacts to a joke that he does not get but everyone else is in on. My judgment came pretty much out of ignorance, I really had no idea how these cartoons were made and I had no idea why they were so popular. Last night after I saw a whole new slew of these comics I decided to educate myself on the movement instead of hating on it. As I do many times when I want help, I reached out on Twitter. I asked that someone please fill me in on these comic scenes taking over Facebook. My answer came quickly as a few of my followers quickly informed me of the hottest new app: Bitstrips. I immediately downloaded the app and started exploring. 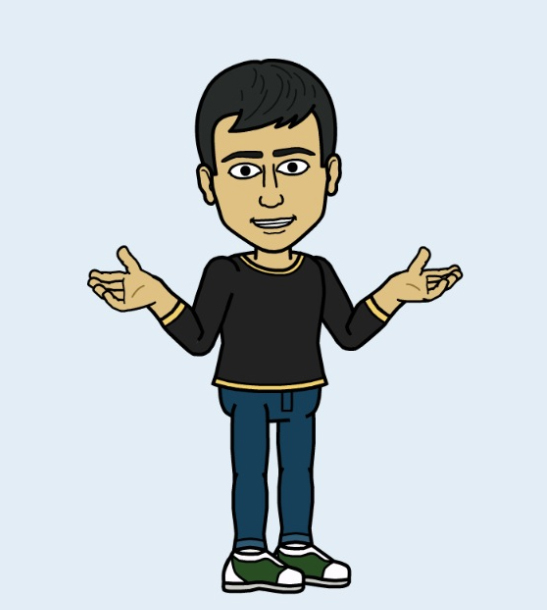 Still a little jaded at first, my initial thought playing around with Bitstrips was the exact same as what I had when I viewed everyone else’s comics…stupid. I think this was mostly because I hated the way the cartoon version of myself looked. I didn’t think it looked a thing like me. But I felt this way prior to when I discovered that there are several options you can utilize to make your cartoon avatar look a little more like your actual image. So after I messed around with my hair length, hair style, skin tone, and wardrobe I became a little more satisfied with my appearance. I then went ahead and created a “status cartoon” of me in the office. Even though pretty underwhelmed with the rather boring scene of me “seizing the day” I tried to upload it to Facebook. It didn’t work. 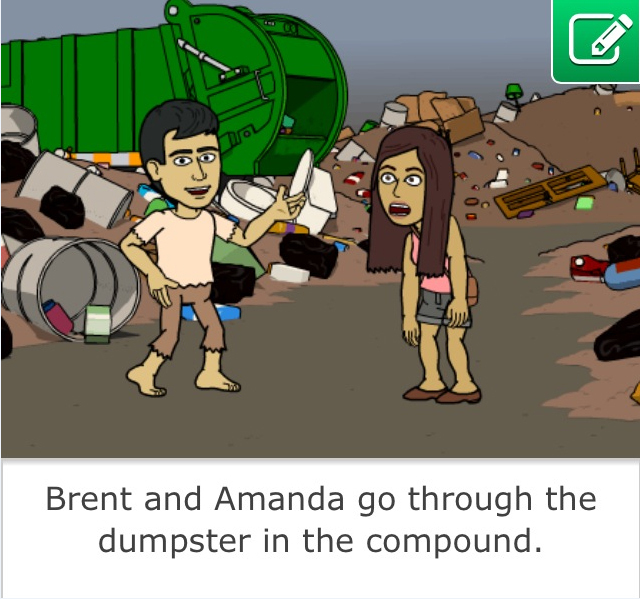 Bitstrips was not off to a good start in Brent’s World. This is what I came up with for the Bitstrip version of me. However, I didn’t want to stick a fork in the app right away. Instead of deciding to produce content immediately I took a step back and decided to just investigate the various features of Bitstrip. My disdain for the service turned to joy when I looked at the avatars of all my friends who were already on the service. I scrolled down with a grin a mile wide as I looked at their depictions of themselves. Many of them were spot on! Some intentionally embellished certain physical traits that they hold and I couldn’t help but laugh. While I disliked what I produced for myself, I loved what others were able to come up with. Then, instead of creating just a lame cartoon with myself in it I went to the option where I could create one with one of my Facebook friends in it. One thing you have to know: You can’t create your own comic. Bitstrips forces you to choose from one of their premade designs. With that said, they do offer some funny and cute options and you can change the captions. I had probably a too good of time creating some comics featuring my friends and I. 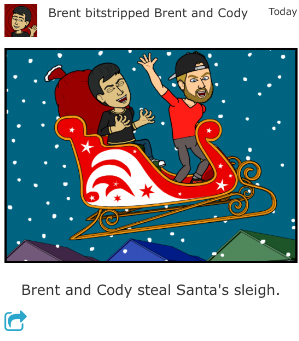 This is a Bitstrip I created of my cousin and I. After getting a feel for the service and starting to have some fun, I went back to my avatar and continued to fine tune my appearance. Although I still am a little frustrated with how I look, I think I am starting to get to the perfected Bitstrip image of myself. So while I do like some features of Bitstrips it has by no means won me over. I think it is lame that you can’t have more control over the content you create. Yes, the service does come up with some funny ideas but we all know we could do much better with placement control. We all have our own sense of humor and inside jokes that we could incorporate that would make for very funny comics. Also, you can only include one friend in each comic. Time to expand a little bit, we all know that the more the merrier. This is a Bitstrip of my friend Amanda and I. This is one where I edited the caption. The social engagement element of Bitstrips is lacking too. Through the actual application you can’t like or comment on comics. This is where the fun of social media is at! If we can’t make our own jokes within the actual comics, at least let us make them underneath it in a comment section. The potential for interaction with this service is high but right now Bitstrips has all options turned completely off. Finally, it bugs me that I am having trouble posting to Facebook. Then again, I should maybe retract my words and take it as a blessing because I don’t think Bitstrips is a good thing for Facebook. I think the comics look out of place and tacky on a timeline or on a newsfeed. I think these comics belong housed inside their own application where people who appreciate this type of social expression can go and view several at a time while commenting and liking away. Of course this comes from a guy who believes that for the most part social media content should be as unique as possible and to accomplish this the wholesale sharing of pictures/statuses/video/etc across every single social network should be avoided with the exception for truly outstanding content. I say go ahead and download Bitstrips. Give it a shot and see if it is something that you like. Even if you still hate it, at the very least it will educate you on one of the newest and hottest apps out there right now. What are you waiting for?! Go make the perfect cartoon version of yourself. Don’t Blink.